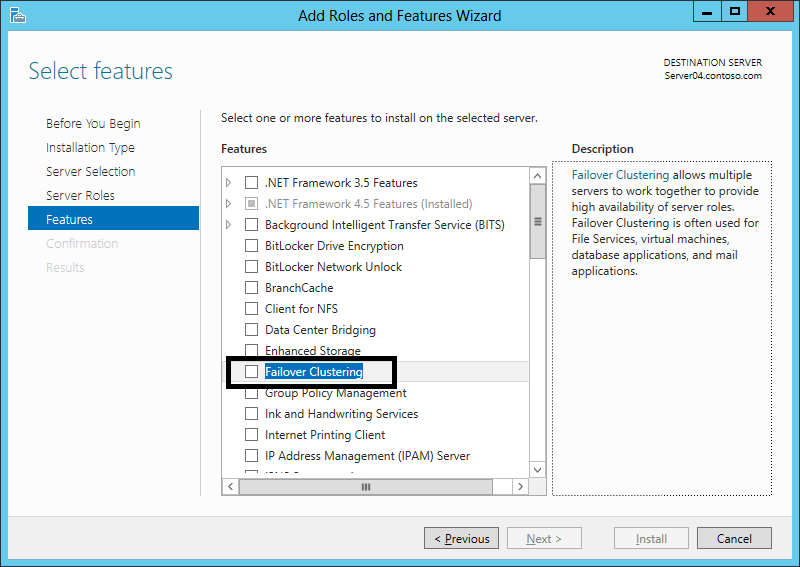 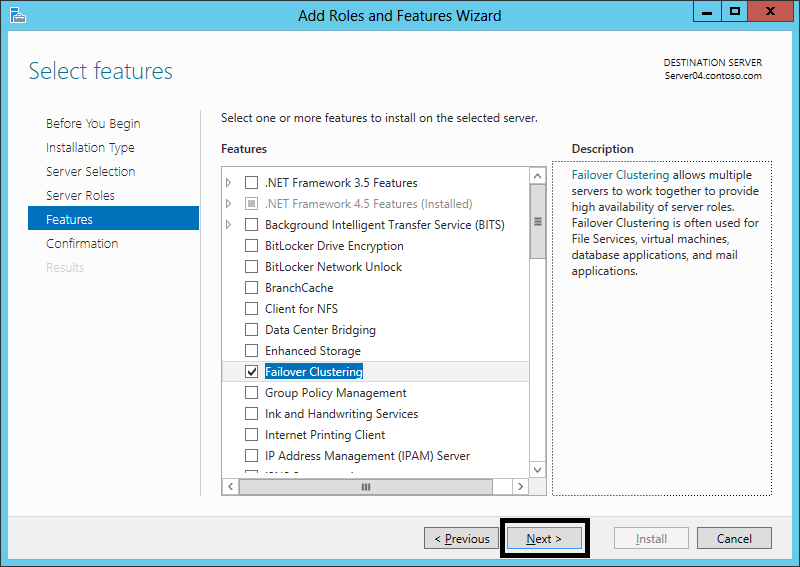 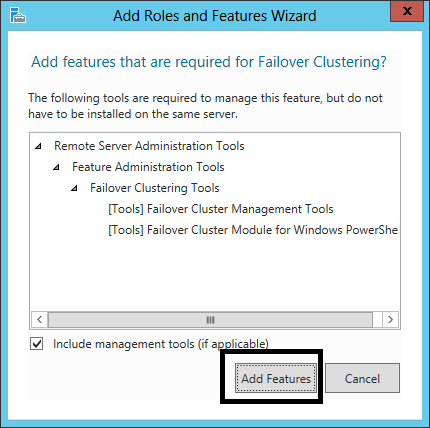 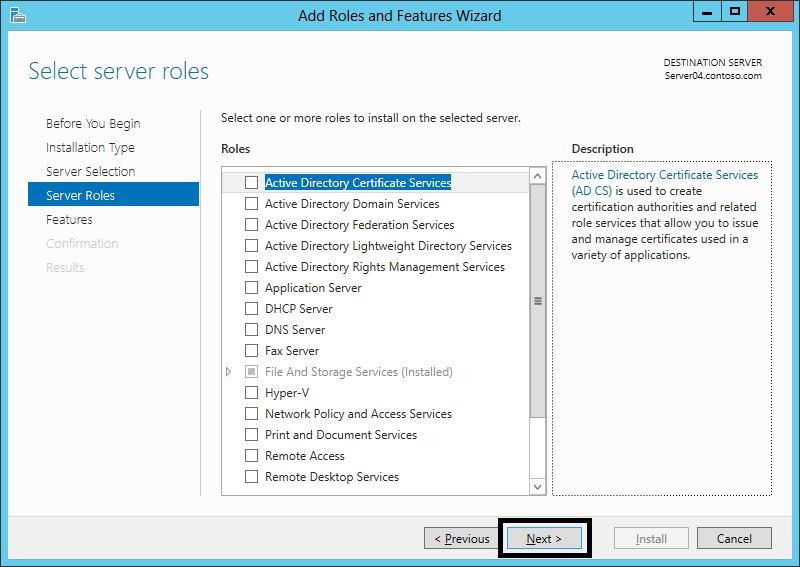 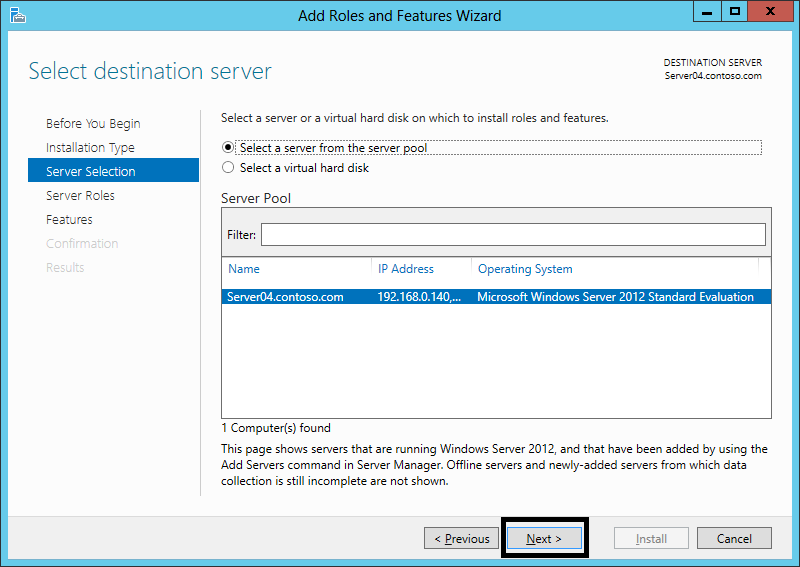 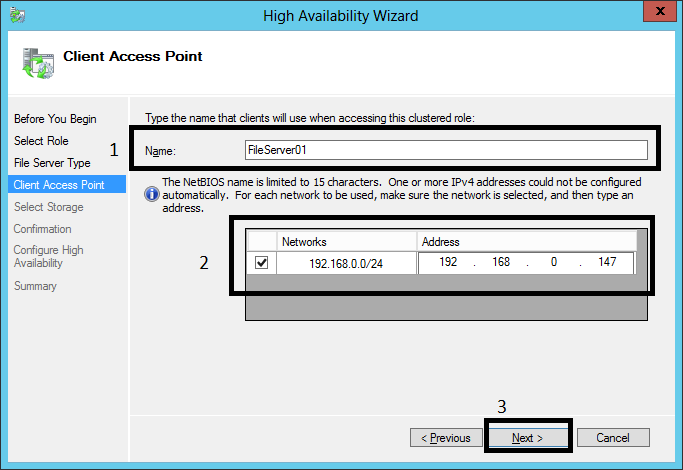 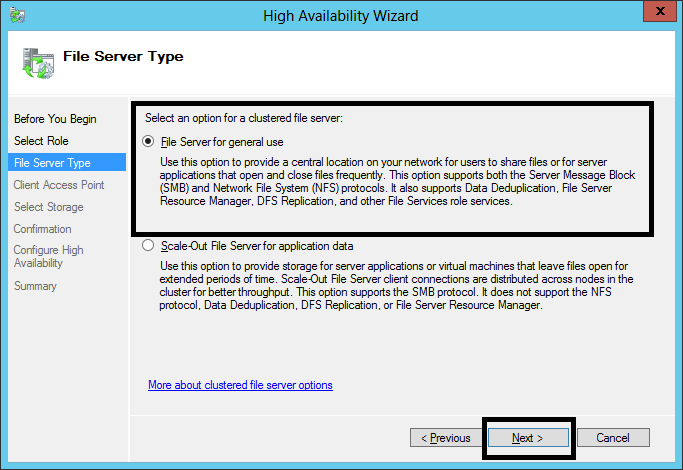 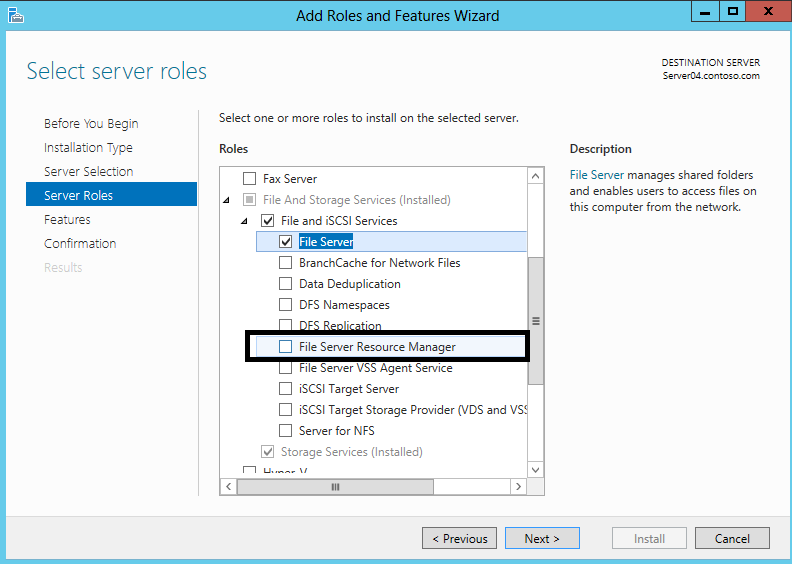 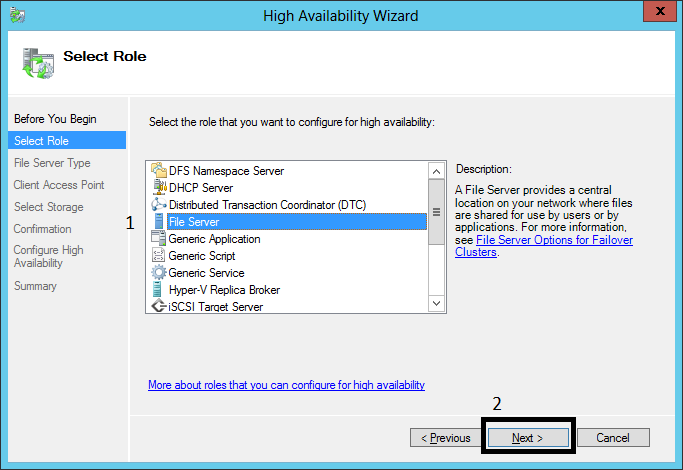 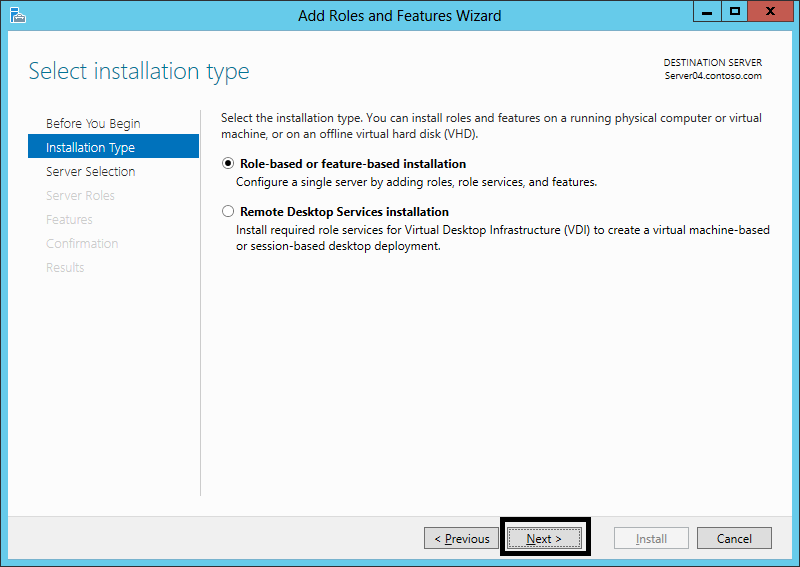 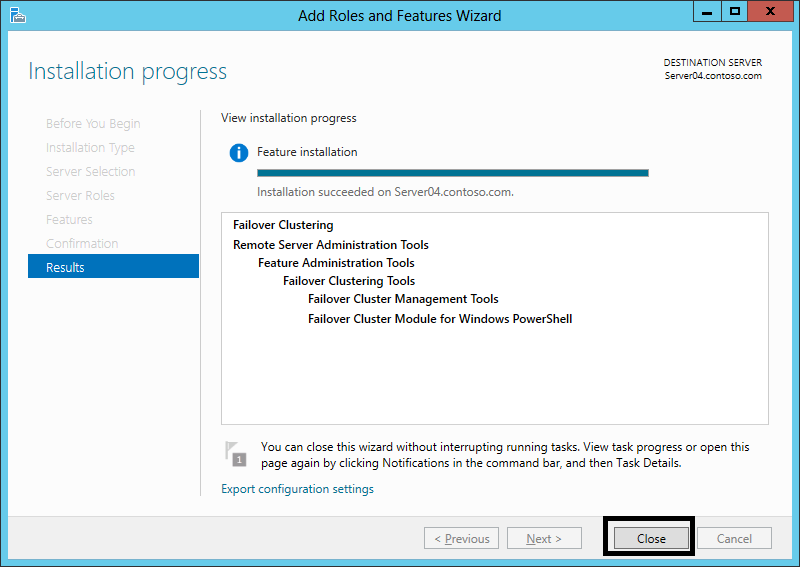 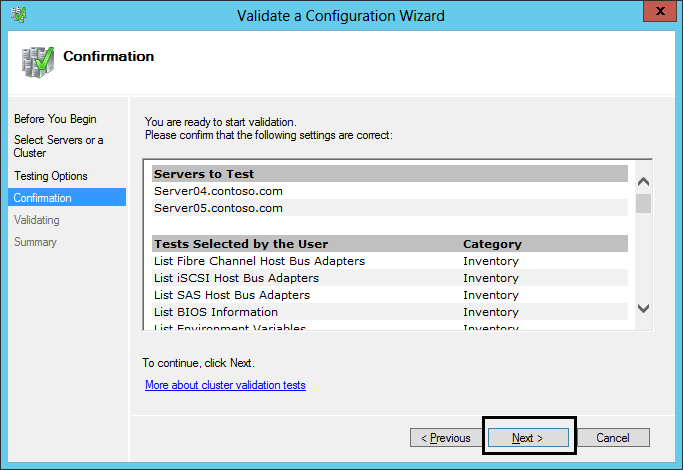 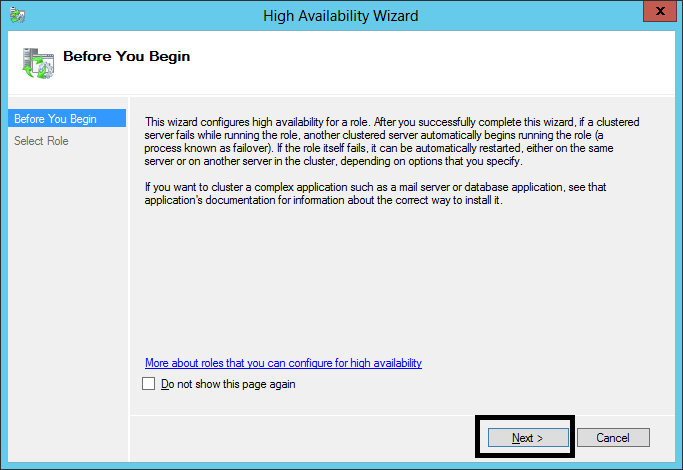 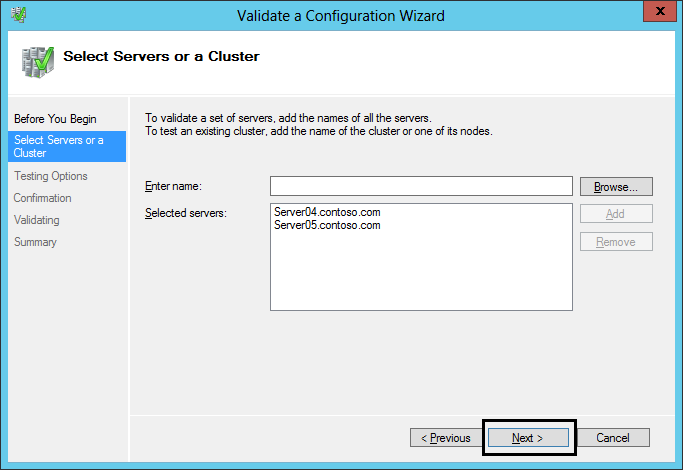 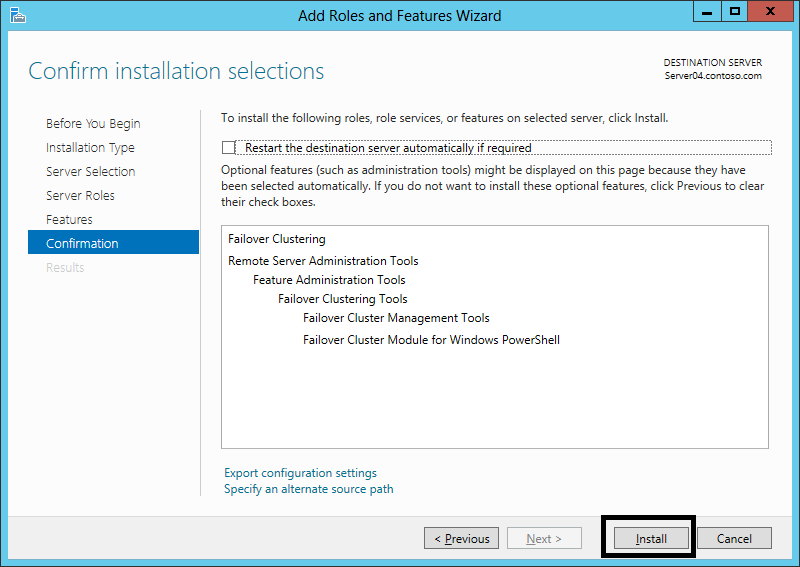 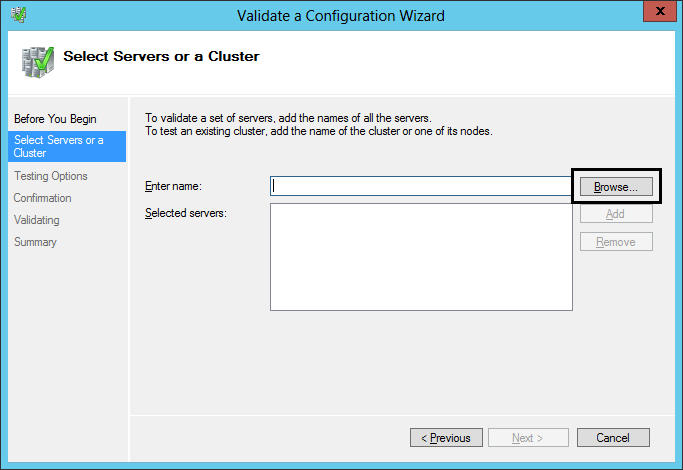 This is a step-by-step guide on how to set up a failover cluster in Windows Server 2012. 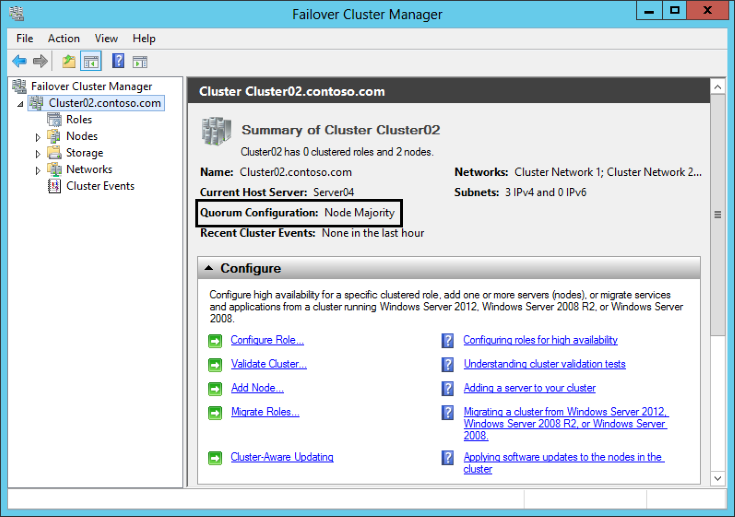 First we will install the failover clustering feature, with the management tools. 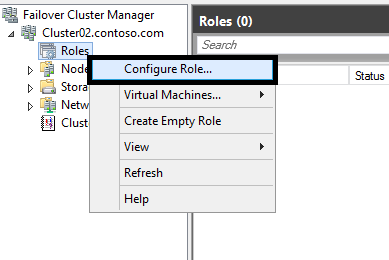 Then we will create the cluster, and finally we will install a role on the cluster. 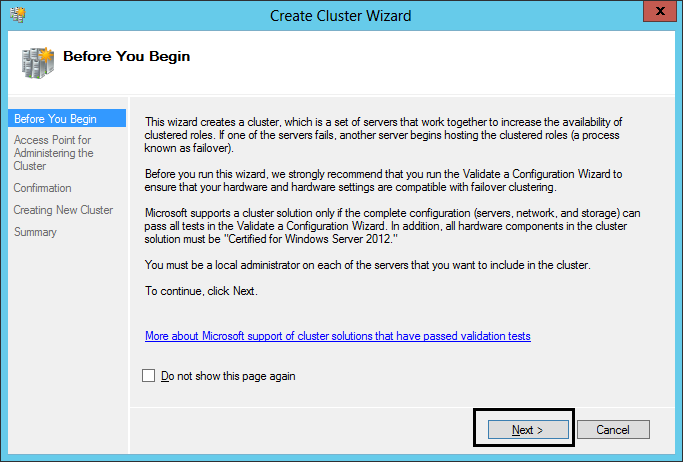 In Server 2012, clustered services and applications are called clustered roles. 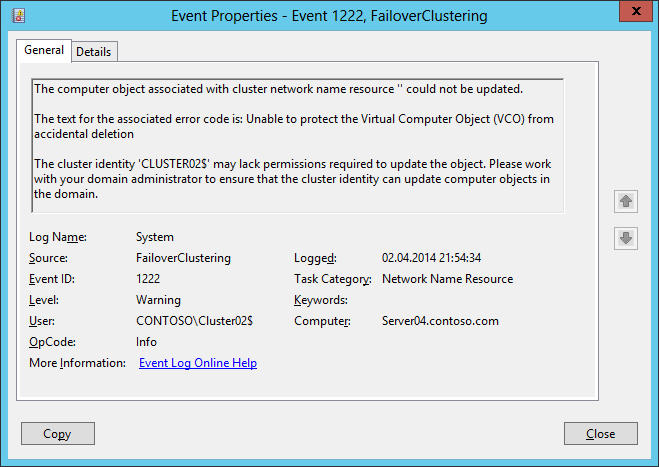 There is actually not much difference in creating a cluster on Windows Server 2012 than in Windows Server 2008 R2. 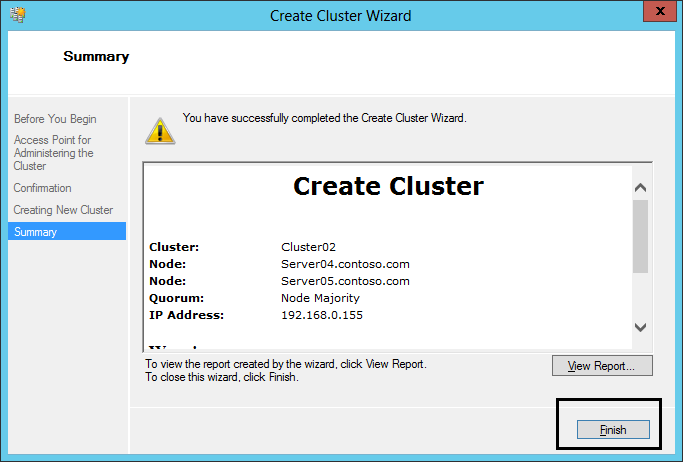 There will be two nodes in the cluster we are going to create. 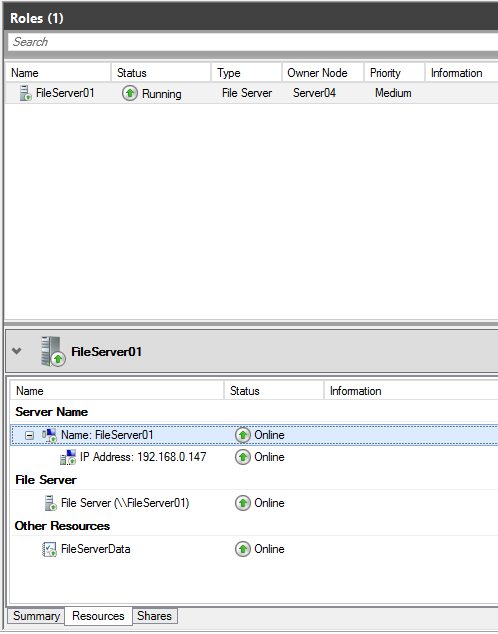 Both of them have three NICs each, and both are running Windows Server 2012 Standard Edition. 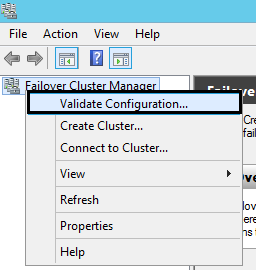 You obviously need to install the Failover Clustering feature on both nodes. 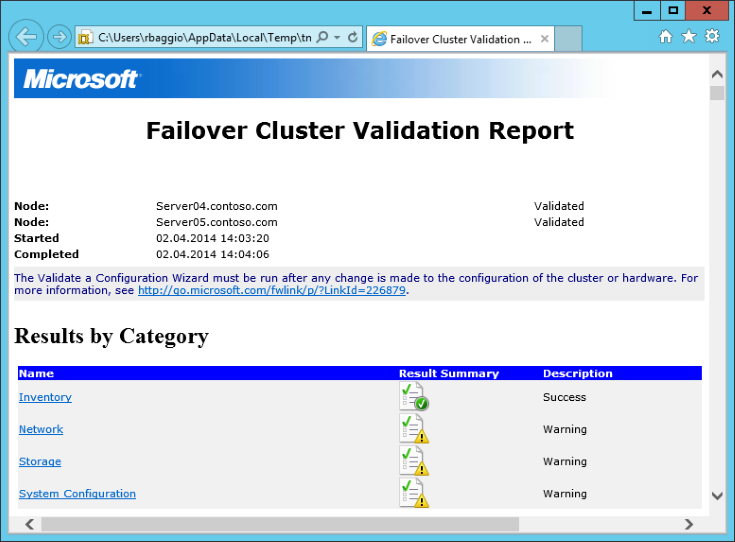 3.1 Start Failover Cluster Manager from Administrative Tools on either Server04 or Server05. 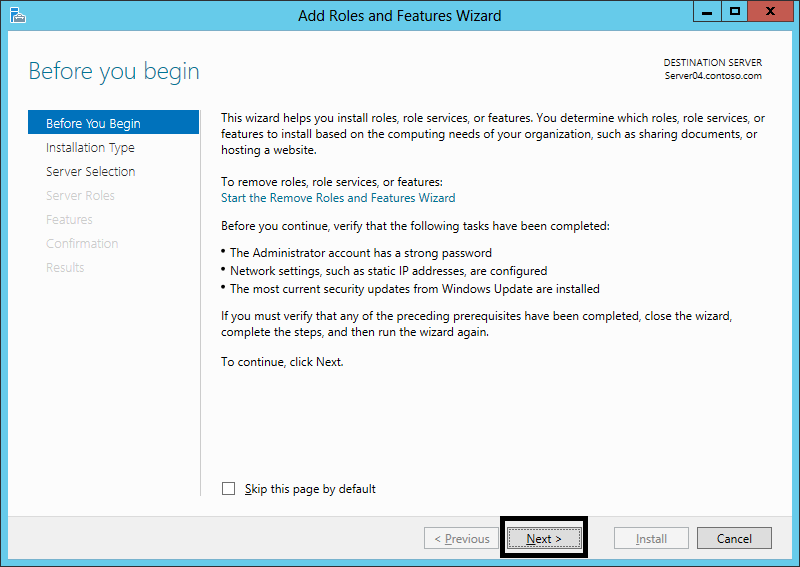 3.10 As you can see I received some warnings, if you click on the link in the report, you can see what the warning is about. 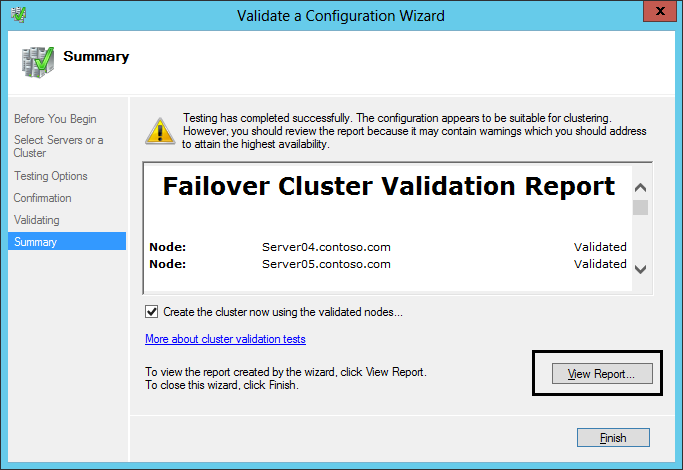 The report will be saved at %systemroot%\Cluster\Reports , so you can review it any time you like. 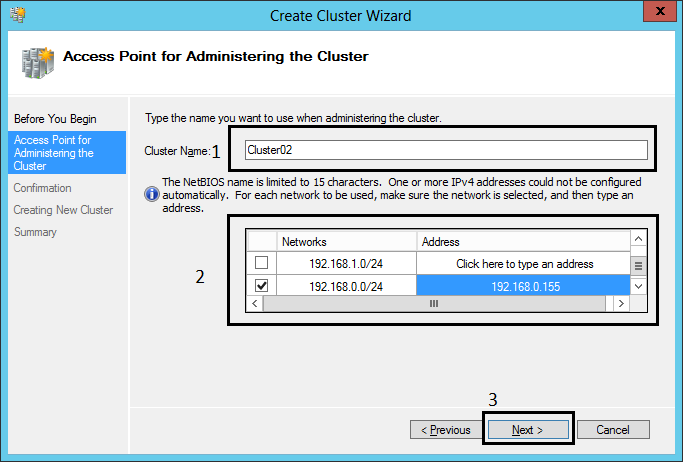 3.11 I have some unsigned drivers on the cluster nodes. 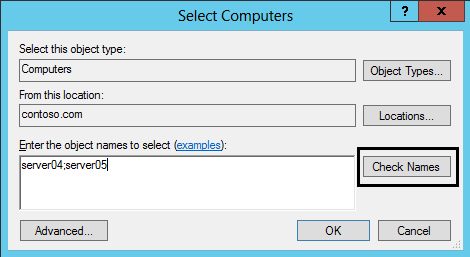 You should try to find out the cause of all warnings, by reviewing them one by one. 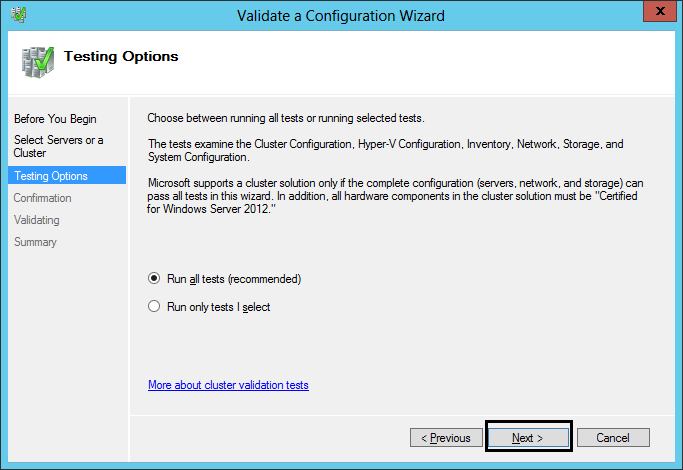 In my case, its just a test environment on VirtualBox, so obviously there are going to be some warnings of trivial matter, and in a test lab you can safely ignore all warnings of trivial matter. 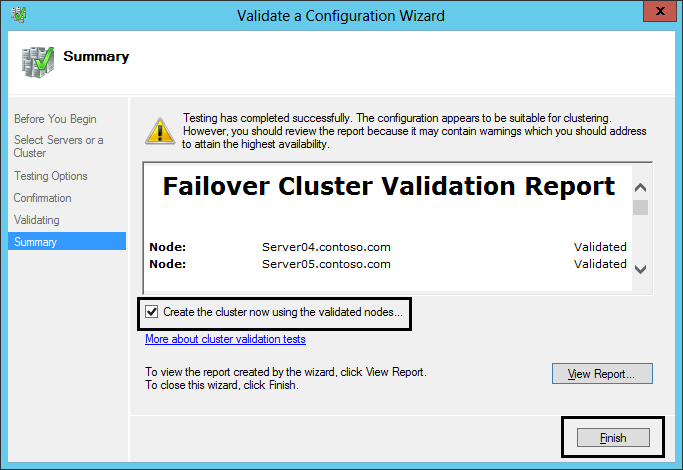 If you receive any errors though, then they must be corrected before the cluster can be created. 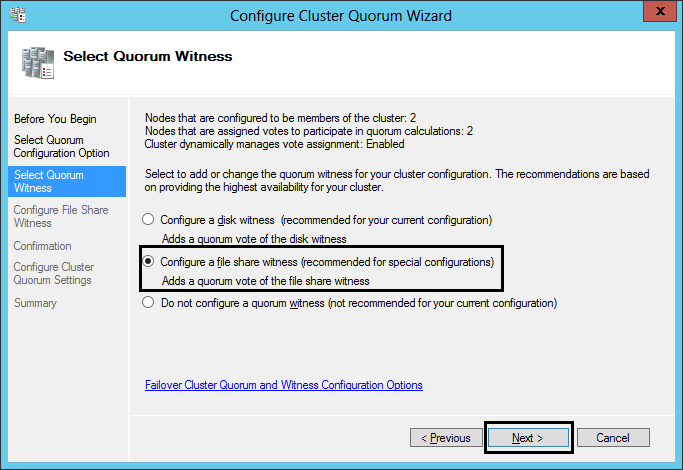 4.5 Choose Add or change the Quorum witness, and then click next. 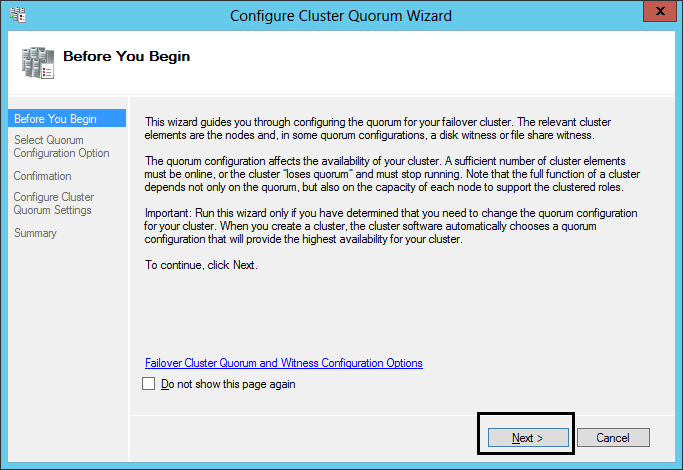 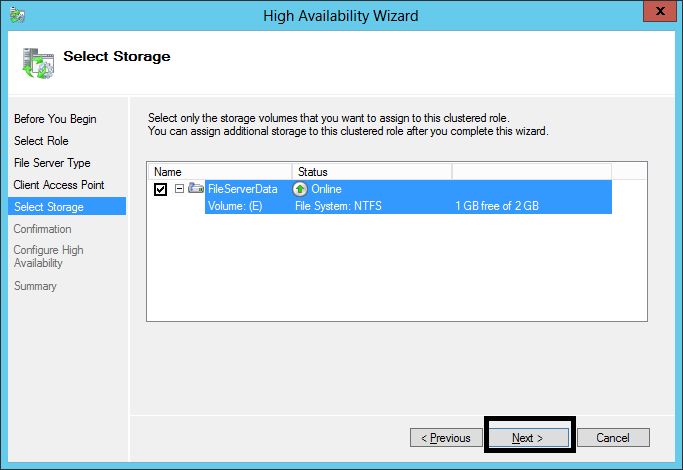 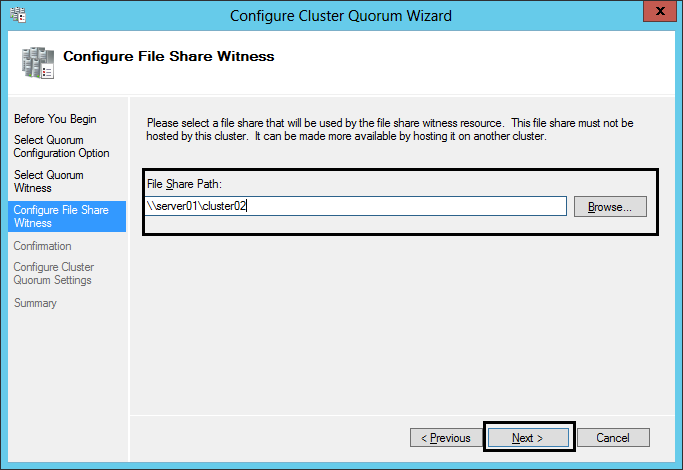 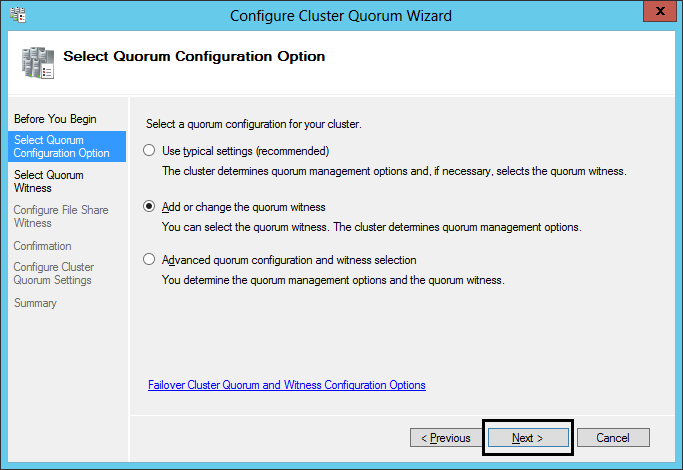 There are some new Quorum options in Server 2012, which I will explain in a later post, for now we can just keep it simple. 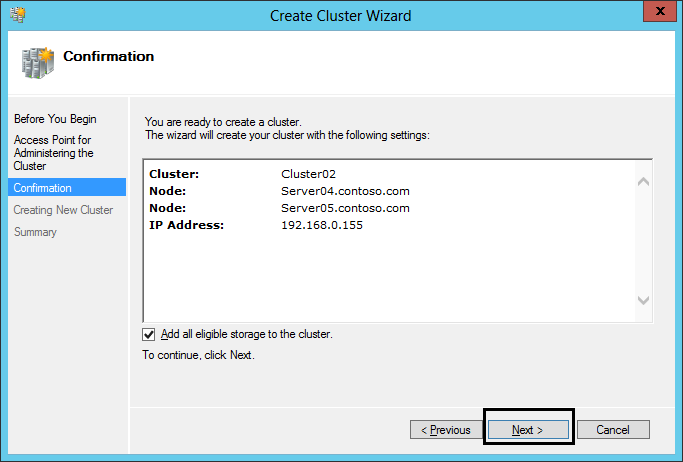 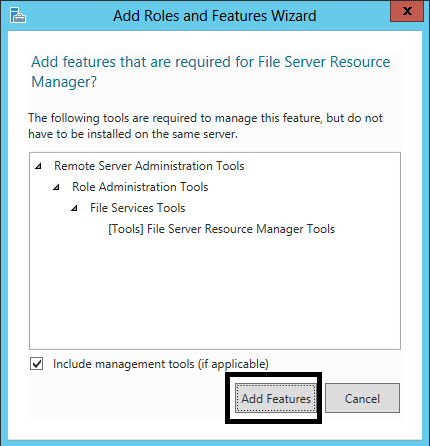 5.1 We will configure the File Server role on the cluster. 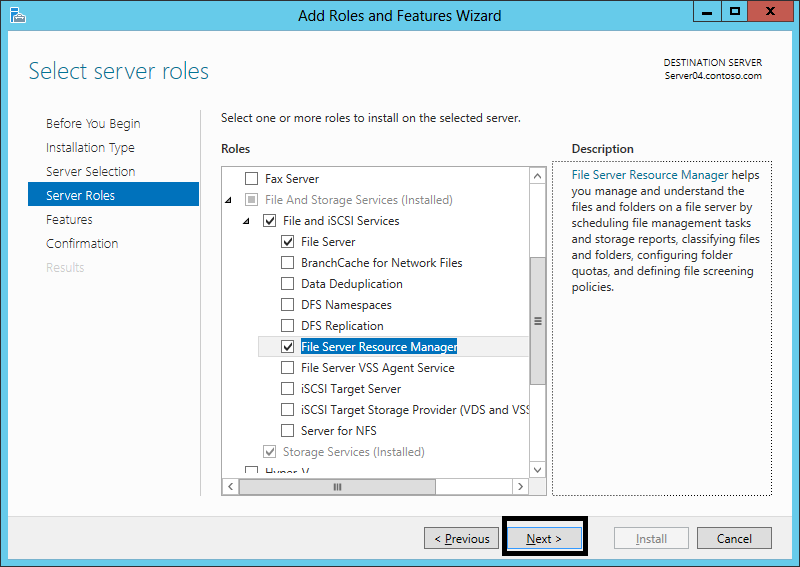 But before we can do that, we need to add the File and iSCSI Services role on both nodes. 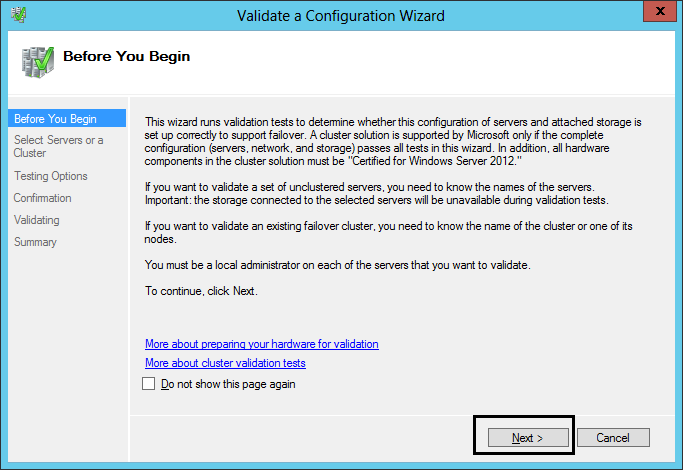 6.7 You will be presented with the clustered file server you just created. 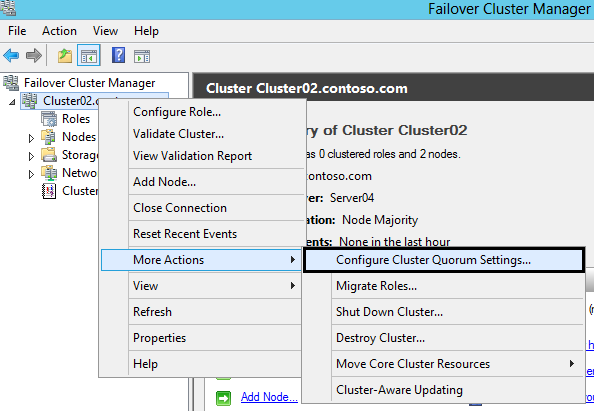 And that’s it, you now have a clustered file server clients can connect to, and which will automatically failover to the second node, if the first node fails.